Heavy fog was a factor in two separate multi-vehicle accidents that took place outside of Tulsa, Oklahoma last week, causing nine injuries. The first incident occurred Thursday evening on Highway 75, east of Ochelata. A Ford pickup truck reportedly crossed the northbound lanes in order to turn south. The truck, driven by a 51-year-old man, was struck by a Toyota Avalon traveling north. Police say the pickup truck’s driver was intoxicated at the time of the crash. Heavy fog was also a factor. Neither driver was wearing a seatbelt. Both drivers, a passenger in the pickup truck and three children riding in the Toyota, were injured and transported to nearby hospitals. The next accident occurred Friday morning at approximately 3:36 a.m. A vehicle headed southbound on Highway 75 struck a cow that was standing in the road. Next, a Hummer headed in the same direction also hit the cow. A second cow was hit by a southbound PT Cruiser, then the PT Cruiser struck the Hummer. The crash shut down southbound Highway 75 for two hours due to clean up. Dense fog was a factor in the three-vehicle, 2-cow incident which sent three people to a nearby hospital. Our personal injury lawyers in Tulsa were saddened to hear this news. Fog greatly reduces visibility for drivers, and we know that leads to an increase in auto accidents. 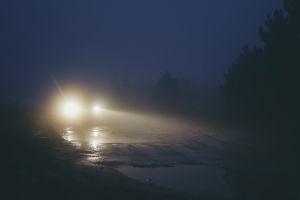 Use low-beam lights; high-beam lights reflect off the fog back toward the vehicle, further reducing visibility. If available, use fog lights. Never stop on the road; pull over to a safe spot on the side, and turn off your lights to prevent confusion. Were you injured in an automobile accident? If so, you may be entitled to compensation for your injuries, medical bills, lost wages, and pain and suffering. The auto accident attorneys in Tulsa at The Edwards Law Firm will work diligently to recover maximized compensation in your case. Schedule your free consultation today.